The Queer Delinquent: Impacts of Risk and Protective Factors on Sexual Minority Juvenile Offending in the U.S. The study of gender and crime has followed a trajectory, from finding that women offend differently, to exploring how gendered lives impact the nature and extent of offending. This has shown criminologists that our theories must account for the variance in gendered lives. 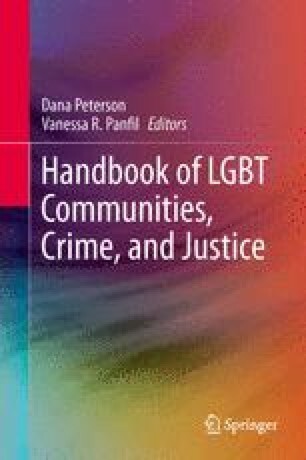 With this chapter, I propose a similar trajectory for understanding the role of sexual orientation and offending, beginning with youth. Using The National Longitudinal Study of Adolescent Health (Add Health, n = 14,290), I provide a baseline, national examination of the nature and extent of juvenile delinquency in the United States, when sexual minority status is considered. I begin to show how the differential life experiences of sexual minority youth impact offending by exploring how various risk and protective factors related to social institutions influence juvenile offending, comparing sexual minority youth to their majority peers. I find that sexual minority youth, relative to their sexual majority peers, report more prevalence and frequency of several (mostly non-violent) criminal behaviors. I show that a variety of protective factors (such as school and family attachments) and risk factors (such as alcohol use, victimization, and housing instability) can account for much of that difference. I demonstrate that sexual orientation is indeed another crucial attribute for understanding the relationship between social inequality and delinquency, and discuss possible points of intervention with youth, based on these findings. I also show that current theories are insufficient to fully explain the offending of sexual minority youth.